All around you are ingredients that you should avoid. Learn how to read labels & look for things that aren't always positive additions to the ingredients list. Here are four things that you should be looking for on your ingredients labels, and avoiding, when you are considering the purchase of a cosmetic or personal care product. Synthetic Fragrances - 90% of things listed as "fragrance" are synthetic. Many synthetic fragrances contain dangerous phthalates. The FDA has linked phthalates with birth defects, cancer, allergies, infertility, and they are known reproductive toxins. BAD STUFF in fake scents! Primarily "eth's" & 'PEG's" - Sodium Laureth Sulfate, PEG (Polyethylene Glycol), Oleth, Myreth, Ceteareth, etc. These produce 1,4-Dioxane, a known carcinogen. Propylene Glycol - this popular humectant can cause contact dermatitis by rupturing cell membranes. Preservatives - Parabens (look for the suffix "paraben" on the word) are quite questionable and have been linked to cancer and hormonal disruption. 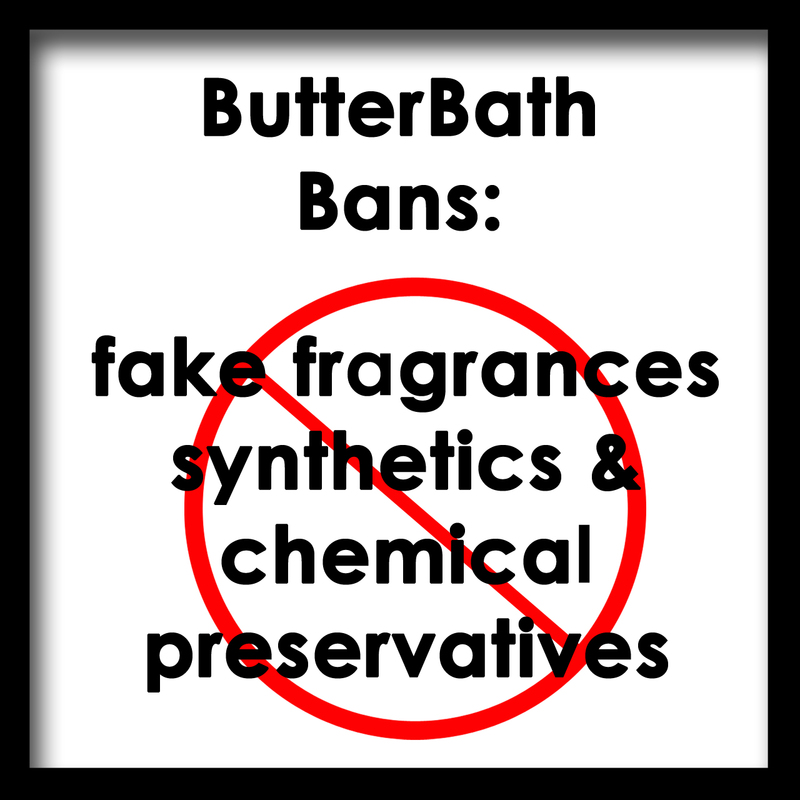 The Butter Bath Company never dilutes any products with water, greatly reducing the need for any harsh preservatives. Instead, we only utilize natural ingredients that function effectively as preservatives, such as essential oils. Primary sources: The Green Beauty Guide, Julie Gabriel, Health Communications Inc., 2008. Campaign for Safe Cosmetics, Fragrance Article, http://safecosmetics.org/article.php?id=222.